The seabird colonies of Northumberland’s Farne Islands are among the crown jewels of the nation’s birding sites and draw thousands of visitors from other parts of Britain and overseas every year. 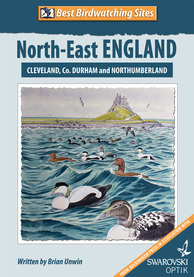 Dip into this detailed guide and you’ll soon realise the region has so many more things to offer birdwatchers – for readers who enjoy striding out, author Brian Unwin has spotlighted a host of magical walks in the interior of Co Durham and Northumberland, while along the coast he recommends scores of wetlands and wooded denes that prove so attractive to migrants. As a founder member of Durham Bird Club, Brian Unwin was an avid birder with an encyclopedic knowledge of the region’s birds and sites. Now you can benefit from his expertise. Birding tips, based on the author’s own experiences, to ensure you get the best from each site. Reliable and up-to-date bird information. Detailed maps and helpful directions to each site. Advice on public transport and accessibility issues. Checklist of birds for the three counties and a month-by-month guide to what birds to expect.